Yay MFA! This will help keep your Qwill account even more secure from unauthorized users. To read about what MFA is, visit our FAQ on multi-factor authentication. 1. Log into Qwill on your via the web app and click “Account Settings” on the left navigation menu. 2. 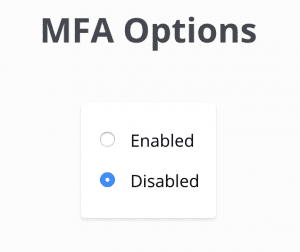 By default, MFA is disabled on the MFA Options screen. Click the word “Enabled” to toggle it on. 3. On the setup screen, you’ll see a QR code and a long text key. You’ll need your mobile device for this next step. There are two ways to scan the QR code. First, on an iPhone, you can open up your camera app and use your camera to scan the QR code. A button will appear asking you if you want to open it in the Google Authenticator app. Click to open. If you don’t have an iPhone or the camera scan doesn’t work, then go to your app store and search for “Google Authenticator.” Install and open the app on your phone. 4. If you scanned the QR code using your camera, then Google Authenticator app will ask you if you want to add a token for the email address that you used to sign in to your Qwill account. Click Yes. From there, you can scan the QR code that’s on your computer screen in the Qwill web app. 5. You’ll see a new account appear named “Qwill”, with a 6-digit code and your email address underneath it. This has created the link between Qwill and the Google Authenticator app for MFA. For this demo account, the code is 587066. 6. Back in the Qwill app on your computer, enter the 6 digit code that appears in your Google Authenticator account and click submit. Note: the code changes every 30 seconds, so make sure you click submit while the code is still valid in the app. 8. Each time that you log back into Qwill, whether on the web app or mobile, after you enter your password, we’ll ask for your MFA code. Just open the Google Authenticator app, copy the code next to your Qwill account, and enter it into the Qwill app. Voila! Account secured.